Don archer, Director, MOCA Museum of Computer art. 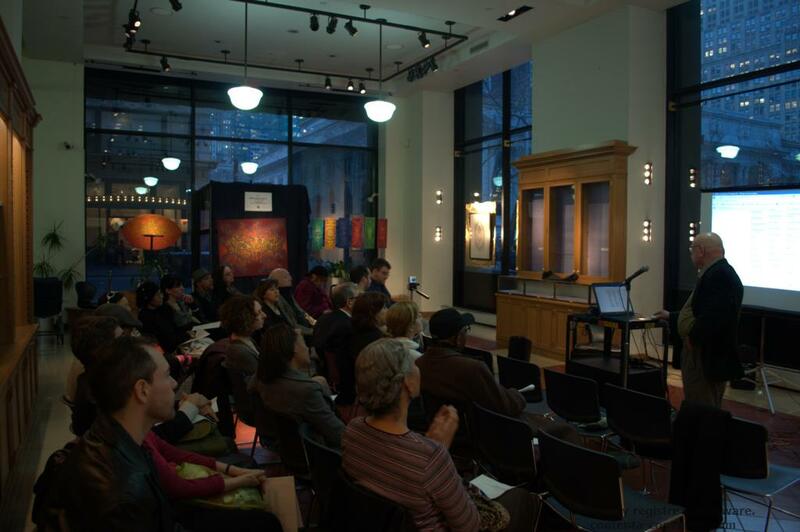 Topic: Influence of Native American Art in North American artists. Don Archer (born 1930-) is a fractal artist and founder of MOCA, the Museum of Computer Art (founded in 1993). The MOCA website is one of the most respected computer art museums on the Web and host to hundreds of world-class digital artists and thousands of images. 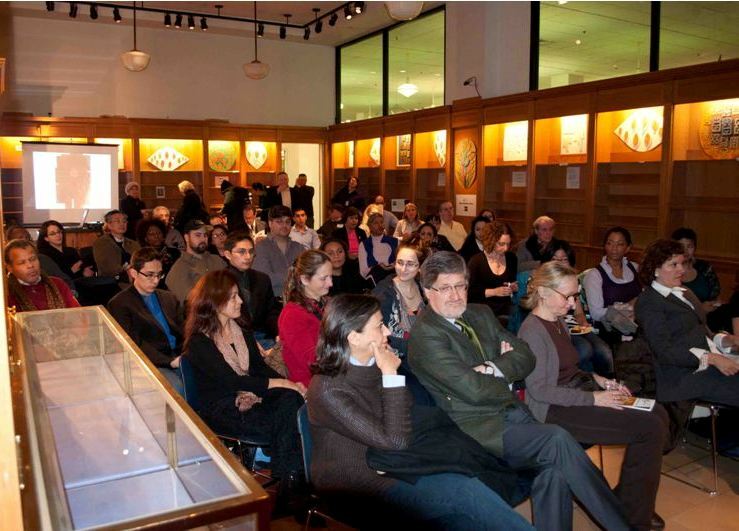 In 2008, MOCA established a physical gallery in Brooklyn NY showing digital art in print and on-screen. 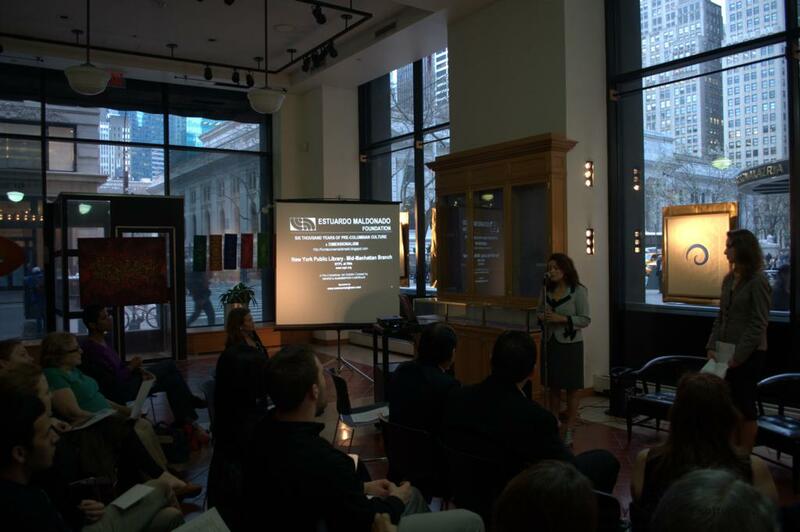 Conference: Six thousand years of Pre-Columbian culture and its evolution into Dimensionalist Art. A brief overview will make us understand the magnitude of the influence of Pre-Columbian Art in the evolution of Contemporary Art expressed through works done in stainless steel with a three-dimensional influence. Estuardo Maldonado (born 1930 Pintag, Ecuador) He is a master Latin American sculptor and painter inspired by the Constructivist Movement. Maldonado is a member of VAN (Vanguardia Artística Nacional), the group of Informalist painters founded by Enrique Tábara. Other members of VAN included, Aníbal Villacís, Luis Molinari, Hugo Cifuentes and Gilberto Almeida. Maldonado’s international presence is largely due to his participation in over a hundred exhibits outside of Ecuador. His work has a universal quality that speaks to expansive audiences. Maldonado’s work depicts abstractions of nature. His ancestral roots are also evident in some of his works based on Pre-Columbian imagery from his native Andean zone. At the same time, he is interested in the palpitation of the evolving Universe. It is because of this inherent curiosity with advancement and history that he has a place within the Latin American Constructivist Art Movement. 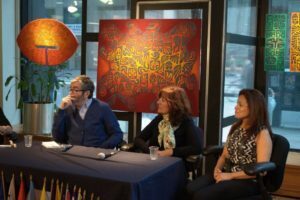 In 2009, Maldonado was awarded the Premio Eugenio Espejo, his country’s most prestigious National Award for Art, Literature and Culture presented by the President of Ecuador. Vladimir Tatlin founded Constructivism in Russia in 1913. Influenced by Futurism and Cubism, this movement is based on abstract, geometric forms and is related to architectural ideas. The Constructivist Movement made its way into Latin America by way of Joaquin Torres Garcia and Manuel Rendón. Constructive Universalism is an innovative style created by Joaquín Torres García who after living in Europe for over forty years, returned to his native land, Uruguay and brought with him new artistic concepts. Constructive Universalism combines references to the Pre-Columbian world with the geometric forms of European Constructivism. Jaime Andrade will present us with a more intimate vision of the artists and their work through his experience at Knoedler and Company Art Gallery. His direct contact with the artists and their relationship and influence with primitive art will give us a unique visual on the work of artists such as Rotko, Andy Warhol, Helen Frankenthaler, and Herbert Ferber. 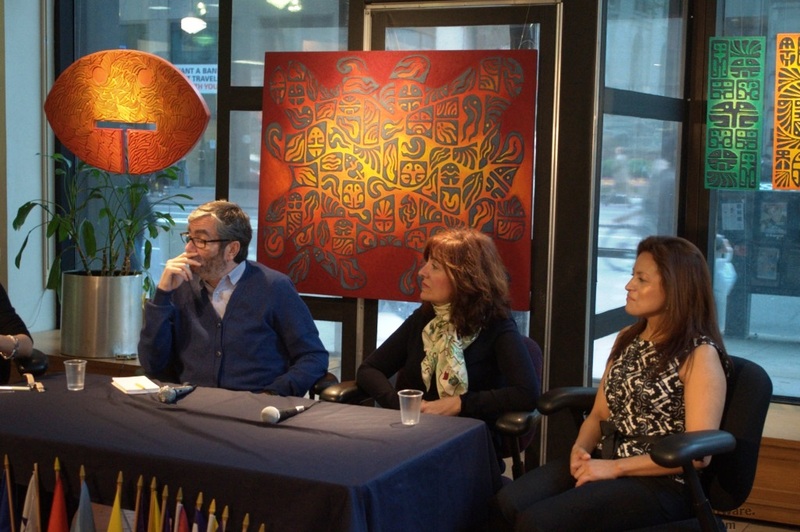 Jaime Andrade (Otavalo – Ecuador) 40 years in the art world, currently continuing work at Knoedler & Company Gallery, has developed and curated different exhibitions in the United States. His work and direct contact with the artists gained him a wide experience in the knowledge of American Art. Their art collections include pre-Columbian archaeological pieces, classic art and modern. As an art dealer and expert in modern art, he has collaborated on various publications and listings of works of art. A presentation of the archaeological site of Catequilla, an astronomical observatory 1,000 years old, which is located exactly on the equator and marks a relationship to the position of churches and cities in South America. The inhabitants of the equatorial zone in pre-Hispanic times held their territory in relation to celestial bodies, particularly the sun, ordering their constructions in relation to rising and setting of the sun. These alignments draw a sketch of a land that over the centuries is still present in contemporary culture. In the video, Científico Quitsa, Dr. Cristobal Cobo gives us a holistic perspective that includes studies of astronomy, archeology, history and geography, which gives a context of the worldview of the Native American inhabitants of the Andes Equator. This will be a multimedia presentation with images and videos by Gabriel Roldós, project representative in New York. Gabriel Roldós is the Executive Producer and Director of Fluid New Media Lab, an initiative that uses new media to create, host and archive art proposals using audiovisual technology. The project has been the scene of contemporary art by local artists and international areas of cultural activism and art in performance, including the Local Project, Flux Factory, Queens Museum of Art, El Museo del Barrio, 3rd Ward and Ten10 Studios. He was a special guest, presenting multimedia collaborations at international festivals such as the VFF, aluCine, and Toronto New Media Arts Festival. His career started as a visual communicator for the project Scientific Quitsa-to, and evolved into a lecturer on the project in the New York City. During his stay in this city has hosted several educational workshops in media arts, as well as exhibitions and events in public spaces in the New York. Elvira Lindo (born 23 January 1962 in Cádiz, Spain) is a Spanish journalist and writer. Her first novel was based on one of her fictional radio characters, the madrileño boy Manolito Gafotas, who has become a classic of Spanish children’s literature. Lindo has also written adult novels and plays; she is the screenwriter of the film La primera noche de mi vida, and collaborated with director Miguel Albadalejo on the screenplays for Manolito Gafotas and Ataque verbal. She also adapted the screenplay Plenilunio from the novel by her husband, Antonio Muñoz Molina. Ever since her husband Antonio Muñoz Molina was appointed director of the Instituto Cervantes of New York, Lindo has lived in New York City. She often writes for the Spanish-language newspaper El País, contributing editorials, and writes freelance work for other magazines and newspapers. In 1998 Lindo was awarded the Premio Nacional de Literatura Infantil y Juvenil (National Award for Children’s and Youth Literature) for her book Los trapos sucios de Manolito Gafotas, and she received the Biblioteca Breve (Tiny Library) Award for her adult novel Una palabra tuya. Her next book, Lo que me queda por vivir was released on September 3rd 2010. Scripts1998: Manolito Gafotas, 1998: La primera noche de mi vida, 2000: Ataque verbal, 2000: Plenilunio, 2000: El cielo abierto, 2008: Una palabra tuya, 2010: Lo que me queda por vivir. Antonio Muñoz Molina (born 10 January 1956) is a Spanish writer and, since 8 June 1995, a full member of the Royal Spanish Academy. He currently resides in New York City, United States. In 2004-2005 he served as the director of the Instituto Cervantes of New York. He was born in the town of Úbeda in Jaén province. He studied art history at the University of Granada and journalism in Madrid. He began writing in the 1980s and his first published book, El Robinsón urbano, a collection of his journalistic work, was published in 1984. His columns have regularly appeared in El País and Die Welt. His first novel, Beatus ille, appeared in 1986. It features the imaginary city of Mágina — a re-creation of his Andalusian birthplace — which would reappear in some his later works. In 1987 Muñoz Molina was awarded Spain’s National Narrative Prize for El invierno en Lisboa (translated as Winter in Lisbon), a homage to the genres of film noir and jazz music. His El jinete polaco received the Planeta Prize in 1991 and, again, the National Narrative Prize in 1992. His other novels include Beltenebros (1989), a story of love and political intrigue in post-Civil War Madrid, Los misterios de Madrid (1992), and El dueño del secreto (1994). Margaret Sayers Peden’s English-language translation of Muñoz Molina’s novel Sepharad won the PEN/Book-of-the-Month Club Translation Prize in 2004. He is married to Spanish author and journalist, Elvira Lindo. 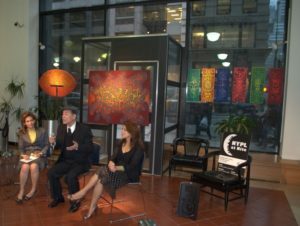 Faustino Quintanilla, Executive Director Queensborough Comunnity College Art Gallery/CUNY and Museum. His talk will delve into the importance of Primitivistic Art and its heritage in the Museum. He will look at the purpose, development and services provided by the institution in the culture. Mr. Quintanilla, a native of León, Spain, received a B.A. in philosophy from the Monastery of Santa Maria, Burgos (Spain ), an M.A. in theology from the Pontifical University , Rome ; a B.A. in Art from Wagner College , and an M.F.A. from Pratt University . He is currently pursuing a doctorate in canon law and liturgical studies at Ignatius University. Balancing work as an artist, curator, and educator, Quintanilla is a former master printer for Wagner Graphics Studio in New York; founder and co-editor of Artview , a State Island arts magazine; founding director of the Elizabeth Anne Seton Memorial Gallery in New Brunswick, New Jersey; and an adjunct assistant professor of art (printmaking) at the College of Staten Island. Currently, he is writing a monograph with catalog raisonné on Peruvian master Jaime Vazquez. Mr. Quintanilla’s works have been exhibited in solo shows at the Snug Harbor Cultural Center, Springham Gallery (Matawan, New Jersey), Robert Wood Johnson University Hospital; Pratt Institute; Kade Gallery, Wagner College; and in group exhibitions at ARCO Gallery, Huesca, Spain, the Metropolitan Museum, New York; and Hanson Galleries, New York. In 1989, he was selected to represent the United States in a show of contemporary art at Salon des Nations, Paris.